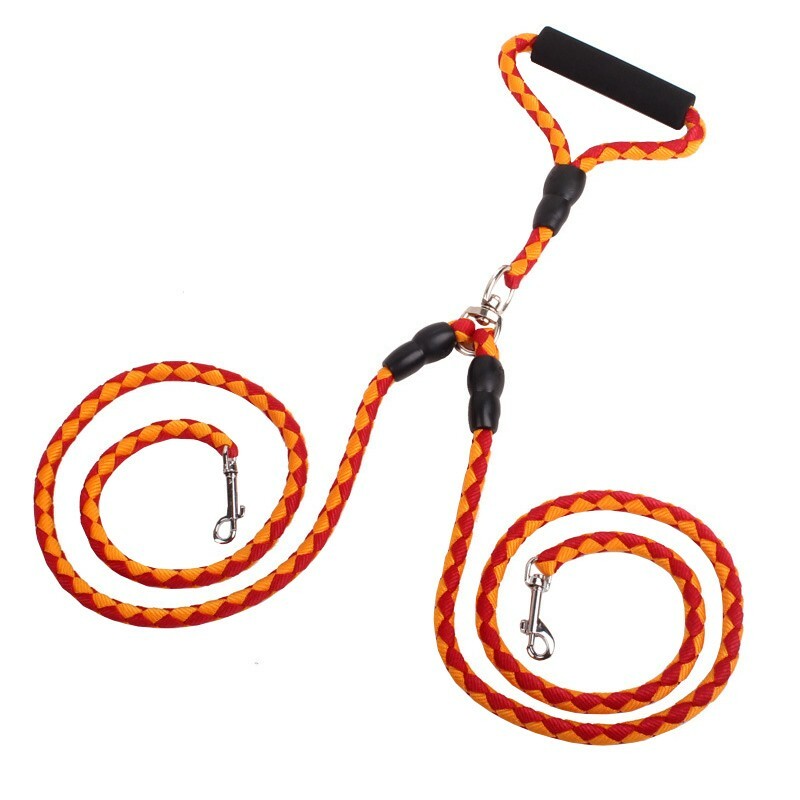 100% nylon rope makes 2 dogs walking safe, which offer free exploration for two dogs. Rust-resistant clasps are designed for long lasting use and can handle strong puller as well. Zero tangle design makes 2 dogs walking much easier than other designs. No twisted leashes anymore. You can enjoy one-hand free to do other things. Soft-grip handle fits your hand well and can reduce hand strain. A comfort that deserves to be kept in mind. Now, many families have more than one dog at home, 2 dogs can be good friends instead of being lonely. A dog is single fun and 2 dogs can make joy double. If you are a lazy parent who loves pets but do not have much time to play with your furry friend, then having 2 dogs will be the best choice for you. Because in multiple dog families, 2 pets tend to have a lot of playing together, play fighting and chasing. and when they’re tired out, they lay together to relax. When you take the 2 pets for walking everyday, they will behave well, because much of their energy will have been burned off by playing together. See, 2 dogs makes everything easier. This is the best $9.99 investment that I have ever made. I was constantly having to untangle my dogs the entire time walking them. Considering I walk them 4 to 5 times a day that means that an hour and a half to two hours of my days were spent untangling. I cannot rave enough about this leash! Samoa is only two and very rambunctious so I thought that she would drag Shadow but as long as I hold the middle firm she goes one way and Shadow can go the other. The leash length is long enough to give them some space to wander but not so long that it will get wrapped around their legs. I would highly recommend this leash!! It's well made and works as promised. I especially appreciate the handle and the no-tangle design. But...for me, the dual leash would work better if the split was closer to the dogs. This length of individual leads allows active dogs to get tangled. I have tied the leash so that the split takes place much closer to my dogs and it works so much better for my purpose. I think the design as sold would work better with those dogs that walk passively next to each other. That isn't the case with my young, curious dogs. Good for the price but upon opening it it doesnt look like it will last long. The rubber over the weak stitches do not stay in place and slide down the leash allowing the seems to be pulled on. If your dogs aren't pullers it's a steal! works great for my two small dogs! makes walking much easier. Great quality leash! Love that it doesn't tangle when the dog croos paths.